Cancer as a life-threatening disease represents the ideal field in which interprofessional practice model may be applied. A number of issues arise regarding how to apply it efficiently because the patient-centered approach requires personalized attention to the specificity of each single patient. For instance, when significant comorbidities, such as major psychiatric disorders, complicate the patient's clinical situation, there may be negative effects on health outcomes, delaying the correct application of life-saving interventions, and on the cost-effectiveness of health care policies. In this case, training health care professionals, through continuing medical education (CME), on core competences for the screening of psychological distress is warranted. The description of psychological intervention in the following short report aims to underline how paramount is to integrate psycho-social care ininterprofessional practice for the treatment of breast cancer patients with major psychiatric comorbidities. The scientific community has long recognized the high prevalence of psychological comorbidities in cancer patients and its impact both on the patient trajectory in terms of illness adjustment, compliance, adherence and concordance to treatment, and on the health care system interms ofcollateral costs due to psychosocial burden[1,2]. The National Institutes of Health Consensus Conference Statement and the Institute of Medicine[3,4]have identified detection and management of distress and psychiatric disorder among cancer patients as a priority. Patients with cancer suffer from high emotional distress and sometimes meet criteria for threshold mental disorders[5-7]. Among psychiatric morbidities, that of delusion is mainly studied in cancer care as associated withterminally-ill cancer patients’ delirium together with hallucinations. As a first step, it must be considered that a primary challenge in the treatment of delusional disorders is that most patients have limited insight, and do not acknowledge that there is a problem. The treatment of this kind of patient demands more precautions, because the risk of death from breast cancer in such patients seems to be significantly higher compared to the general population. Describing the following case report we aim to provide evidences that integrating psycho-social careininterprofessional practice represents the most valuable strategic choice for the presence of serious psychiatric comorbidities, promoting a patient-centered approachin life-threatening disease. Brenda is a 48-year-old woman from central Italy who was diagnosed with a 1.5 cm breast cancer in August 2014. During the clinical pathwayatIEO, the patient met the surgeon for the outpatient visit at the end of August, in which she reported having been diagnosed with Arnold-Chiari type 1 syndrome and suspected Sjogren syndrome, and seemed to be preoccupied and overwhelmed at having been diagnosed with cancer. Although she did not present lots of medical reports, the surgeon, who first met her, based his clinical decision on what the patient described verbally. Quadrantectomy was indicated and the patient entered the institutional waiting list. The pre-surgical appointment (with the surgeon, the radiologist, the anesthesiologist and the case-manager, usually provided within a month from the first outpatient visit) was scheduled for three weeks later, but on the same day Brenda herself telephoned the clinical secretary to warn that she was unwell and could not attend. The clinical secretary, when asked, referred that the patient seemed extremely anxious but she reported nothing further. Nor she considered asking for a psychological consultation. A new pre-surgical appointment, at the end of October, was then scheduled, without a psychological assessment. On that occasion, when meeting the case-manager nurse, the patient showed anxiety again and focused more on her neurological problems, addressing her sensory abilities after general anesthesia, than on the breast cancer. After a further three weeks, on the date scheduled for admission, the patient entered the Breast Division. She showed great distress and anxiety and spent lot of time with the head nurse complaining of her symptoms and how she felt too overwhelmed to undergo surgery. At that point, the head nurse together with the ward physician, decided to call for the Psychology Unit to intervene. The clinical psychologist was struck by how thin the patient was and her state of neglect, and decided to conduct an assessment interview following the Structured Clinical Interview for DSM IV Axis I (SCID I). The patient was shown to be affected by a somatic delusion. The psychotic symptomatologyaroused in May 2014 after the death of Brenda’s mother from cancer. From the patient’s clinical record, which she showed to the psychologist, it emerged that she had been prescribed with antipsychotic drug Olanzapyne, but had never taken it regularly. The clinical psychologist decided to conduct an interview with the patient in presence of her husband and her sister. A very difficult social-family situation emerged. From May 2014, her state of delusion had led her to check in at different clinics and to undergo a number of diagnostic examinations. The patient's psychological status, described above, did not allow her to undergo breast surgery on the scheduled day and she returned home. A new surgery date was then scheduled. From that moment, the patient had daily telephone support from the psycho-oncology service, which worked with other team members and tried to look for specialist contacts in the patient’s regional area, so as to build up a cancer center-territorial network that would help her to empower herself and to control the psychiatric symptoms until when she was prepared and available to undergo surgery. 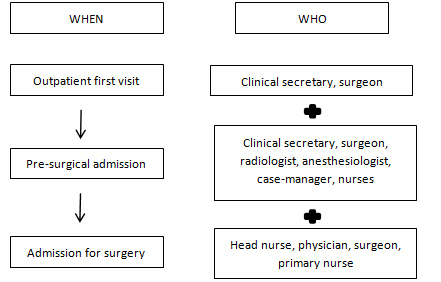 The case was discussed in the weekly multidisciplinary breast division meeting, with the aim of analyzing where the health care model (Figure 1), failed to address the patient's complex situation. The hospital risk management unit was also involved in order to assess current clinical procedure. What emerged was the importance of integrating psycho-social intervention in the interdisciplinary practice, in order to implement patient-centered approach in breast cancer treatment in particular, and cancer treatment in general. Often institutional policies fail in addressing single-patient complexity; nowadays, talking about personalized medicine is inseparable from considering the impact of psychological status on health care outcomes. As a consequence of this case-report, the IEO introduced a broad educational intervention about psychological screening core competences dedicated to nurses and physicians. We argue that specific education protocols in interprofessional practice and more detailed studies, dealing with psychiatric comorbidity and psychosocial support utilization, are needed, and we aim to promote them in order to specifically allocate target-oriented psycho-oncological interventions and services and to address patients, clinicians, providers, and health care policy-makers requests. Health care professionalscaring for cancer patients play a central role in identifying patients with psychosocial morbidity and in referring them for specialist evaluation and treatment. Indeed, from literature emerges that when oncologists' estimates of patient distress were compared to probable cases identified by patient-administered screening measures, the overall rate of correct recognition across several studies was sub optimal, and recognition of distress translated into referral to the psychosocial liaison service occurred only for a minor proportion of distressed patients. These professionals thus need to be trained in core psychological distress screening competences so as to effectively coordinate and integrate one another’s conduct. However, in daily practice, such integrationand coordination is no simple matter: physicians, surgeons, nurses, physiotherapists, nutritionists and social workers, need to work closely togetherwith psychologists to take care of patients effectively. The concept of working together goes beyond just multidisciplinarity where several professionals take care of patients’ different needs. It mustembrace interprofessionality, meaning that there is negotiated agreement between health care professionals who contribute their values andexpertise to patient care. From this perspective, interprofessional education (IPE) offers a possible way to improve collaboration and patient care: health care professionals should be educated not only about how to interact with one another, the so- called intragroup relational competences, and on how to optimally communicate but also about sharing specific competences of each different discipline. In terms of educational contents, surgeons and nurses should be trained about core competences on how to screen psychological morbidities in their patients and which behaviors and symptoms warrant a psychological consultation. Life-threatening disease, and in particular cancer, is a prominent healthcare field for the application of interprofessionality as a model to deliver patient-centered care, intergrating psycho-social perspective. There is a clear need to pay particular attention to the management of psychological and psychiatric morbidities; otherwise a patient presenting a psychiatric problem may run the risk of failing to receive proper care. This also meansa failure in routine clinical pathways in terms of cost-effectiveness, and burden in health care costs. Specific education dealing with relational competences, competences in psychological distress screening and in appropriate referral to liaison psychology services could offer an optimal handlingof these critical situations. Adler NE, Page AEK (2008) Cancer Care for the Whole Patient: Meeting Psychosocial Health Needs. Washington (DC): National Academies Press. Hales RE, Yudofsky SC (2003) The American Psychiatric Press Textbook of Psychiatry. Washington DC: American Psychiatric Publishing. First MB, Spitzer RL, Gibbon M, Williams JBW (1995) Structured Clinical Interview for DSM-IV Axis I Disorders - Patient Edition (SCID-I/P, Version 2.0). New York State: Biometrics Research Department Psychiatric Institute. ©2015Arnaboldi P.This is an open-access article distributed under the terms of the Creative Commons Attribution License, which permits unrestricted use, distribution, and reproduction in any medium, provided the original author and source are credited. Applied Research Division for Cognitive and Psychological Science, European Institute of Oncology, Via Ripamonti 435,20141 Milano, Italy, Tel: + 39 0257489397, Fax: +39 02 57 48 90 01.